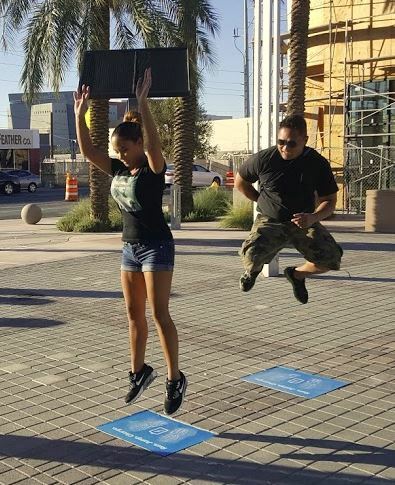 Four years ago, the city of Las Vegas replaced its high-pressure sodium (HPS) streetlights with LED fixtures; since then, the cost of electrifying those lights has been cut in half, saving the city $1.5M a year. 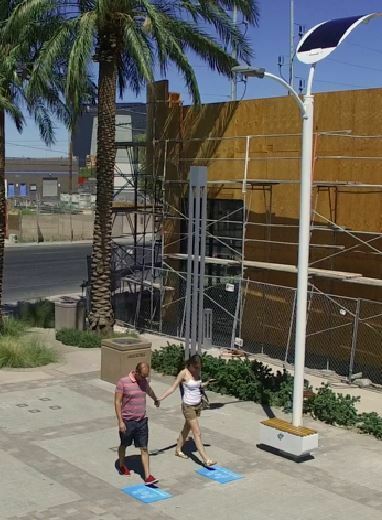 Now, Las Vegas officials are taking the next step (excuse the pun) by testing EnGoPlanet's Smart Solar Streetlights, off-the-grid lights that harvest energy from sunlight and footsteps, store it in on-board batteries, and use it to power the high-efficiency LEDs. Four smart streetlights will be installed as part of a pilot study. Depending on the results, more could be adopted. The lights consist of Cree LED chips capable of delivering 115 lumens per watt; the streetlights are available in 30W, 60W, and 80W flavors. Assuming the lights are on for 12 hours, they would use between 360 and 960 Watt-hours every night. A typical human footstep applies about 80 million dynes (800 Newtons or 180 lbs) of force to the walking surface. 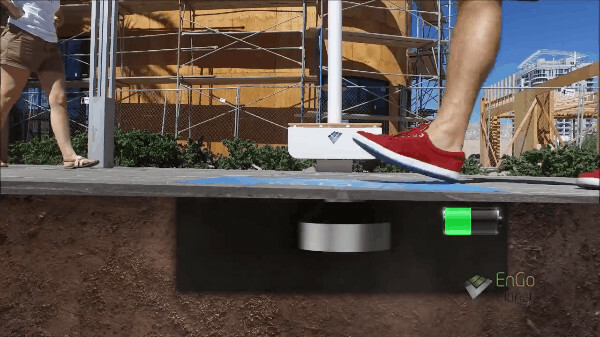 EnGoPlanet's engineers designed kinetic tiles that harvest the energy of walking and use it to generate electricity. The linear motion of a footstep is converted to rotary motion, driving a small generator. I asked a company representative if the power conversion technology was similar to Energy Floors. She said it's similar, but "completely different." (Nobody wants to give away trade secrets.) To increase the power delivered, they added piezoelectric devices. Each footstep causes the tile to produce between four and eight watts of power. Testing showed that in places with a high volume of pedestrian traffic (e.g. 5th avenue in NYC), one square meter of kinetic pads can produce 125 to 180 Watt-hours during a twelve hour period. The solar panels and kinetic tiles send energy to a bank of AGM VRLA batteries. Depending on the streetlight model, the battery bank has a capacity of 1.2 to 3.6 kWh. Assuming the lower end unit uses the lowest-power LED bulbs, that should be enough energy to power the lights for three days. AGM (absorbent glass mat) VRLA (valve-regulated lead acid) batteries are sealed lead acid batteries that are inexpensive, highly reliable, and maintenance-free. They can also tolerate extreme temperatures (-40C to +50C, or -40F to 122F) which is why they're often used as backup power in cell phone towers. When kept above 80% depth of discharge, AGM VRLA batteries can deliver more than 1200 charge-discharge cycles. 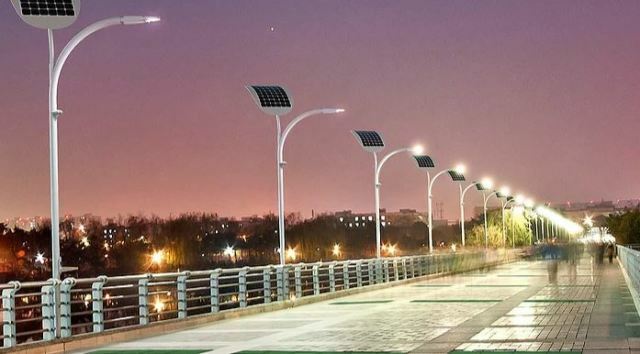 An array of sensors makes this a smart streetlight. Motion sensors can tell if there's nobody nearby, allowing the light to dim and save energy. This will reduce the discharge on the battery, helping to prolong its life. Optional features include atmospheric monitoring (air quality, temperature, humidity), traffic monitoring, and even video surveillance. The light includes USB charging ports and can serve as a WiFi access point. Depending on the model and quantity, these lights cost between $1500 and $4000 (US). 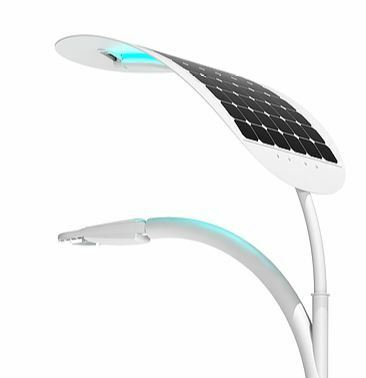 In addition to the Smart Solar Streetlight, EnGoPlanet's product line includes a Smart Solar Bench, a City Station microgrid, and a Portable Lighting/charging station.